Posted on Tuesday, June 30th, 2015 in Featured, Hluhluwe-iMfolozi Park, Kruger National Park, Maasai Mara, Mahale Mountains National Park, Mana Pools National Park, Northern Tuli Game Reserve, Sabi Sands Game Reserve. 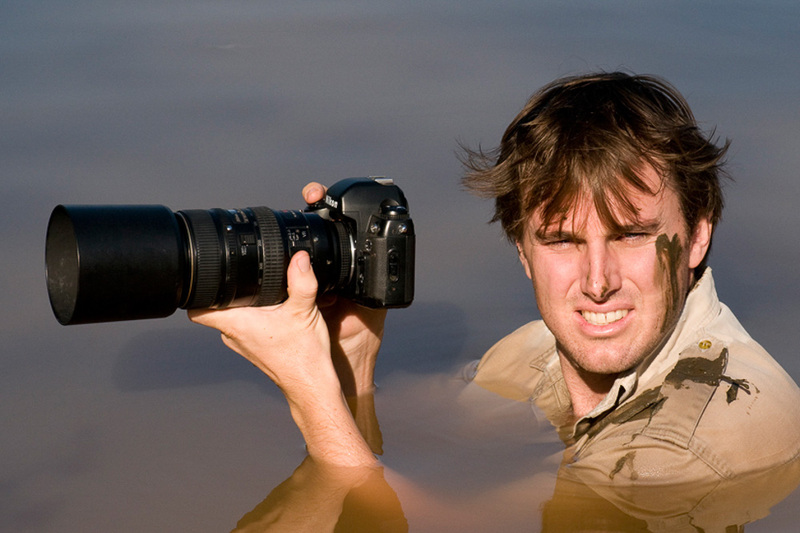 Greg du Toit is probably Africa’s best-known wildlife photographer. In 2013 he won the BBC World Wildlife Photographer of the Year competion. But this award was long overdue. Greg has been taking some of the best wildlife photographs in Africa for almost two decades. Today the 38-year old is also one of the best photographic guides on the continent, and leads tours to some of the most beautiful protected areas in Africa. Check out his website at www.gregdutoit.com. I caught up with Greg recently to ask him a few questions. Greg du Toit photographing the free-ranging lions of the South Rift valley in Kenya – image copyright Greg du Toit. The second is Maasai Mara, because it is the wildlife mecca of the world, and so often people tell me you shouldn’t go there because there are too many tourists, but it’s 1,500 sq km, and if you know where to go, and when, and how, the wildlife experience that you will have is unrivalled anywhere on the continent. 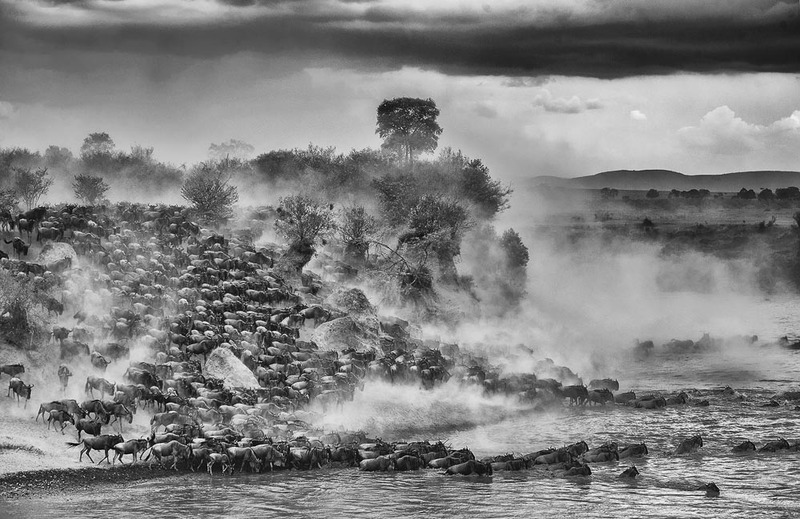 The unrivalled migrations of the Maasai Mara…one of Greg’s favourite places in Africa. My third place is Mashatu, which is in the Tuli block of Botswana. And I like Mashatu simply because there’s great wildlife, but the place is unlike anywhere else. I’ve never seen a place in Africa where you’ve got the black sand in the rivers and the gigantic Mashatu trees. It’s a unique place and an ancient place. I love it and I’m so blessed that it’s only a six-hour drive from my home in Johannesburg. Greg, you’ve had some incredible experiences with wildlife. Which are your top three? About ten years ago, I staked out a water hole in the South Rift Valley of Kenya for 16 months. It was a small water hole, only about 20m in diameter. It was basically a spring on the floor of the Rift Valley. 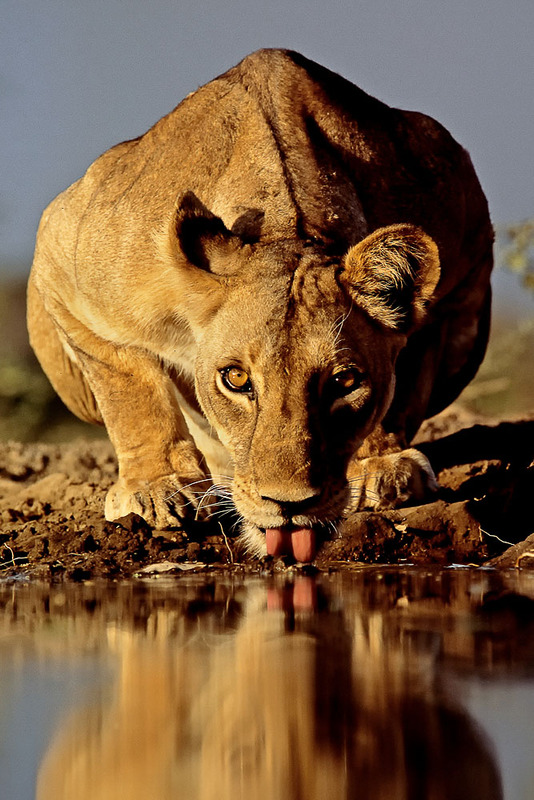 My mission was to photograph the free-ranging lions and I spent 16 months just at one waterhole. The life I saw in and around that waterhole just was mind-blowing. I dug a hole next to the water hole and I put some hessian tacking over the top, and I just witnessed the life that water supports in that dry, arid area. In last three months I actually sat in the water, and I eventually got eye-level photos of these free ranging lions drinking. One of the lionesses that Greg photographed over 16 months while based at a waterhole in the South Rift valley of Kenya – image copyright Greg du Toit. My second most memorable experience was about five years ago. I visited Mahale Mountains National Park in Tanzania; I went to photograph chimpanzees, and just before we’d arrived, there were five dominant males in this one community of chimps, and the four lower-ranking males had ganged up, killed and eaten the number one ranking male. We got there just afterwards, and when we were there, there’s a chimp called Christmas because he was born on Christmas Day, and he was number three in line. But, our guide forewarned us and he said look, because the two males above him are not here, he’s going to try and use us as props to show the other chimps his power and his strength. And what ensued was something I’ve never experienced in my life. Standing in that forest, this chimp called Christmas just charged us repeatedly, screaming, throwing things in the air. He was literally running between our legs, actually making contact with us, and then he would run up to the base of a tree and he would drum against the roots with his hind legs. I’ll never ever forget it. I’ve never been so scared. I was actually too scared to take photographs, and just standing in the small huddle in the middle of this remote, remote part of Africa on the shores of Lake Tanganyika is something I’ll never forget. 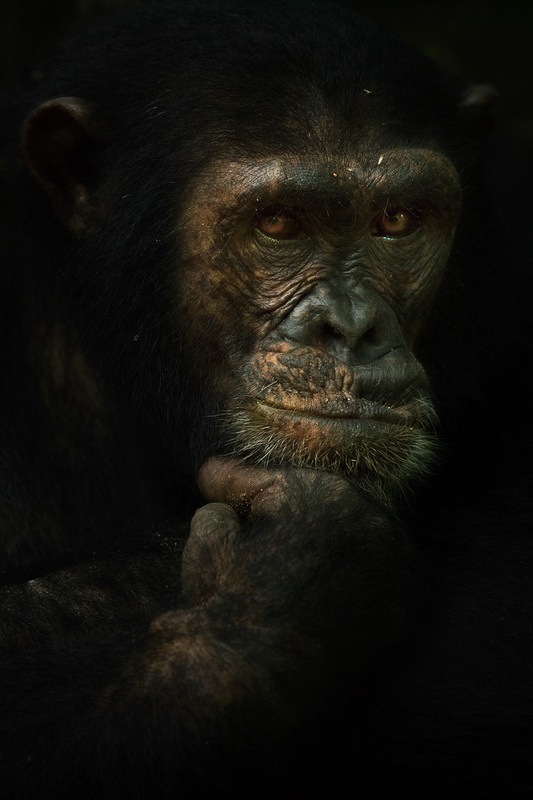 A chimpanzee in the Mahale Mountains of Tanzania – Image copyright Greg du Toit. My third was recently in Mana Pools National Park in Zimbabwe. There was a spring close by to our campsite. This was the only water around for miles, and the wildlife was drinking at the spring all night, so the nights were magical. I’d lie in the sand of this dry riverbed and I’d have breeding herds of elephants walk right past me, herds of buffalo. The wild dogs killed an impala right in front of my campsite as well, which I managed to photograph. Lions walked right past us. A leopard walked right past us. I thought this is as wild as Africa has ever been. There was a full moon too, which was great. If you had to leave Africa forever, and only had three weeks left on the continent, which three spots would you spend your time in, and why? My first one would be Satara Camp in Kruger National Park. That’s where it all began for me. When I was a ten-year-old boy we were there on a family holiday. I’ll never forget leaving. When it was time to go home I was so depressed. I saw the sun rise from within the camp, and I promised myself that one day I would return and work in the bush. I would love to spend one week there, just in Satara camp, camping, braai-ing and just doing it like I did when I was kid. Then, my second spot is quite different. I would go and camp in the South Rift Valley of Kenya, just north of Lake Natron. There’s a magical area there. It’s community-owned but it’s as wild and rugged as Africa gets. What I love about it is you get wild life there, but you still get communities, so it’s a place where man and best still coexist. For me, that’s still a true wilderness, where wildlife has not been segregated from man. It’s so dramatic; you’ve got the wall of the Rift Valley, you’ve got Lake Natron, you’ve got swamps, you’ve got forests, you’ve got rivers. It is, for me, an ancient piece of Africa. And then the last one. I would like to do the iMfolozi Wilderness Trail in Hluhluwe-iMfolozi Game Reserve in South Africa. I’ve never done that. The legendary Ian Player has been one of my huge role models, and I love Zululand. I’ve spent a lot of time in Hluhluwe and Umfolozi, but I’ve never done one of those wilderness trails and I’d definitely like to spend a week doing that. Which are your three favourite wild animals to spend time with? My first is definitely lions. When I say this, it always surprises people because they think lions just sleep. But I love their primal movement. For me, the roar of a lion is the most spectacular sound in Africa. And I love their playfulness, the way the pride plays with each other, the way a male lion, one minute, can run towards you as if he’s about to kill you, and then just flop over. They play both the role of king and jester, and I just love that. I love the fact that they’re regal and powerful, but they’re also stupid and goofy. So, lions are number one. 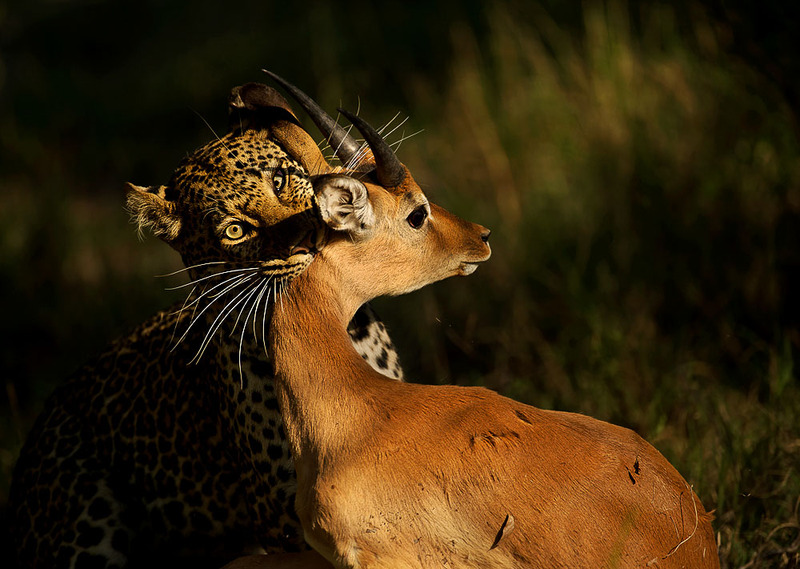 One of Greg’s favourite animals to photograph – the leopard. Image copyright Greg du Toit. Then my third is wild dogs, for their playfulness. Everything is a game for them, even when they are busy killing an animal. They don’t fight with each other, so their playfulness, their teamwork, their camaraderie and their complete fearlessness is amazing. Your best advice to aspiring wildlife photographers? You need to first discover yourself and you get to know who you are, and more importantly, what you are passionate about. Then when you’ve figured that out, just go out and photograph that thing. Lots of beginner photographers want to do it all, but to be a really good photographer you must be a communicator, and you’ll be the most effective communicator if you’re communicating something that you’re passionate about. So it really starts with your own kind of journey in discovering who you are and what you love, and then not compromising and only shooting that. Which people do you admire most in African conservation? Ian Player would be my first person. He inspired me from the age of 16, because of his dedication, commitment and the utter purpose with which he lived his life, which was to try and save the wilderness areas of South Africa. When I was a young boy, he came and spoke at our school when I was 16. I listened to him talk about how he started the Dusi Marathon, and then Operation Rhino, and then the wilderness trails in Imfolozi. He’s been an absolute inspiration to me, so much so that he wrote the foreword to my photography book African Awe. Then he signed a book of his biography for me, which I’ve just finished reading, and obviously with him having passed away, it tends to mean so much more. Second would be Kenneth Newman. I’ve been into birds my whole life and he had the most passion for birds. He hand-painted all 900 plus species of birds in Southern Africa. I admired so much his experiments with little European warblers, where he placed them in the planetarium and proved that they migrate by watching the stars. I’ll never forget Kenneth saying to me that when a chimpanzee took a stick and stuck it in a termite mound and pulled it out, the scientists and the world stood back and gasped. But long before that, he had watched a green-backed heron fishing, catching a spider and dropping it in the water and walking next to the river, using the spider as bait. Third would be Dr Iain Douglas-Hamilton. I spent time up in Samburu, at his research camp, and I just think Iain’s an incredible guy. He must be in his 70s, but he’s a maverick. He’s a crazy bush pilot. He has an incredible spirit of adventure, and he’s pragmatic, similar to Ian player in style. He’s a brilliant scientist and animal expert, but he doesn’t just write scientific papers; he comes up with very real solutions for problems in Africa, and he’s a visionary. As one example, his research revealed that elephants hate the sound of storming bees. So he and his team designed beehives that local villagers can build and erect around their villages. These beehives are linked with pieces of string, and when the elephants come in to raid crops, they bump the beehive, the bees swarm and the elephant then walks off. Hunting. Does it fit into your conservation matrix? If no, why; if yes, why, and with what conditions? My answer is yes and no. Hunting in general has, up to this point, been very beneficial in that wildlife areas have expanded. But I agree with some type of hunting and I’m vehemently against another type of hunting. So, let me tell you of an example of the hunting I agree with. In Timbavati Game Reserve they hunt old buffalo bulls. Now, those buffalo bulls are no longer breeding, so a hunt is set up, and that money is then ploughed back into conservation, ploughed back into running the reserve. I think that’s excellent. I’m totally against hunting where people are hunting territorial animals, especially your wild cats. I’ve seen it in many different parts of Africa with lion hunting, including most recently now in Mana Pools. There’s a national park, and on the boundaries of the park there are hunting areas they are hunting cats. If you shoot one of the cats it creates a vacuum, and that vacuum then pulls in another cat from the conserved area or from the park, and that cat gets shot. Eventually what happens is the population is decimated, so I’m dead against the hunting of leopards and lions, especially. But if you’re talking about hunting older animals that aren’t territorial, that are no longer breeding, and that money going straight back into conservation, then I think hunting is a very pragmatic and wise solution. I do need to mention that most people on the street are against hunting, but every morning they get up and they eat cereal. There’s nothing worse than a wheat field because it’s monoculture, and that wheat field wiped out the natural ecology. If you go out to a restaurant and you order venison steak, you know that where that resource is coming from, there is a functioning eco system that has to support that animal if it’s to survive. Which would you rather have? A wildlife area that has hunting and whose habitat is protected, or a wheat field that has no natural ecology whatsoever? Greg, you clearly have a deep love for African wilderness. What do you love most about it? My photography is an outflowing of my love for wilderness. Wilderness, for me, is a connection with my creator. It’s a place where I really come alive. It’s a place where I can see clearly and I can exist on a deeper level. I miss the feeling of just being able to walk and disappear into the bush on my own with no backpack, no rifle, no camera. That’s really what I miss. Finally, your favourite places to watch the sun rise or set in Africa, and with whom? I’d watch the sunrise at Campbell Koppies in Mala Mala, where you’ve got a view over the lowveld into Kruger. I’d sit there in the early morning with a coffee and rusk, with my old friend Rowan Ravenhill, just because he’s a kindred spirit. He loves the bush, like I do. For sunsets, I’d choose the baobab tree known as Rhodes’ baobab which is growing on top of a sandstone outcrop in Mashatu Game Reserve in Tuli Block in Botswana. And I’d watch the sun go down with my wife Claire by my side. One of Greg’s many award-winning photographs. 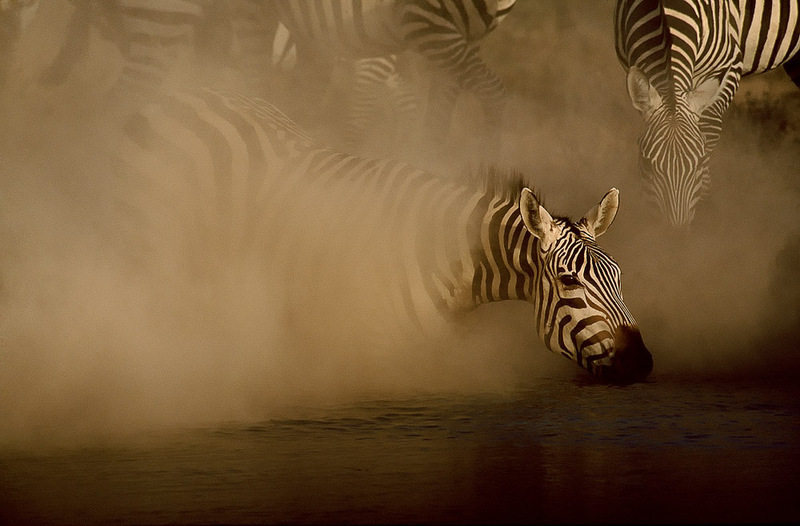 Zebras drinking from a waterhole – image copyright Greg du Toit.